You are in category Politics. A few years (actually, a few lustra) back, a fellow student, who happened to be researching native Quebec languages, was commenting how we Quebecois tend to define ourselves negatively. Not in a sense that we have a bad image of ourselves, but that our identity is made up of nots: we’re not Anglos, we’re not Americans, not Canadians, not Frenchmen, not Natives. Although I think we do have a “positive” identity, there seems to be a once of truth to his statement. I’ve got this coworker who recently moved from Kitchener, Ontario (which we call, around here, moving up); she’s having a hard time seeing that Quebecois are not like Ontarians. In her mind, we’re all the same: we want to be happy, have a family, a good job, etc. She was quite surprised when I explained how Isabelle, when she went to live in Saskatchewan, had a bigger cultural shock than when she lived in Cameroon. She’s also surprised that a lot of people here can often tell a Frenchy from an Anglo a mile away. I work for a company owned by an Ontario one, and we often have to explain to them that what works there (especially in marketing), doesn’t necessarily work here, which any country-wide ad agency will tell you. Then it hit me: it has to do with how we construct our identity. I may be wrong, but I get the distinct impression that Ontarians (and maybe other Canadians) tend to see the similarities first and foremost, at least within Canada. Whereas we here tend to focus on the differences; the similarities are not important: in our mind, it’s what makes us different that counts (again, at least between Anglos and Frenchies). 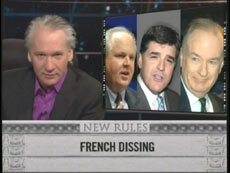 The observers hunch has brought this hilarious Bill Maher commentary about American republicans’ favourite passtime: France-bashing. A must see. It’s hard not to think of Bush as a bully. Actually, it seems to be the core of the Republican ideal, and beyond. Part of Science Idol: the Scientific Integrity Editorial Cartoon Contest of the Union of Concerned Scientists. In other words, it’s their fault for being shelled and killed. 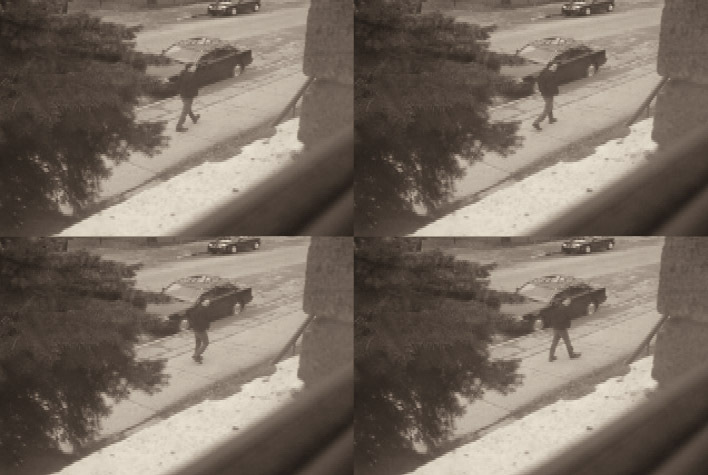 According to him, the attack was not deliberate. That’s possible; after all, the base was only well-established and well marked, far from Hizbollah positions, and the raid only lasted six hours, during which numerous appeals were made. It’s probably not Isreal’s fault either that afterward they shelled the convoy that was granted safe passage to evacuate the place.